A hanger steak is a cut of beef steak prized for its flavor. Derived from the diaphragm of a steer or heifer, it typically weighs about 450 to 675 grams (1 to 1 1⁄2 pounds). This cut is taken from the plate, which is the lower belly of the animal. In the past it was sometimes known as "butcher's steak", because butchers would often keep it for themselves rather than offer it for sale. Anatomically speaking, the hanger steak is the crura, or legs, of the diaphragm. 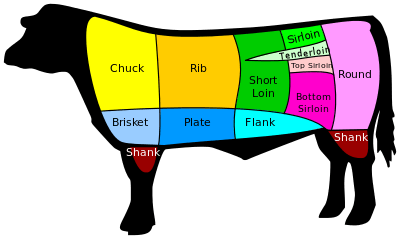 The steak is said to "hang" from the diaphragm of the heifer or steer. The diaphragm is one muscle, commonly cut into two separate cuts of meat: the hanger steak, traditionally considered more flavorful, and the outer skirt steak, composed of tougher muscle from the dome of the diaphragm. The hanger is attached to the last rib and to the front of several of the lumbar vertebrae. The right side is larger and stronger than the left. Occasionally seen on menus as a "bistro steak", hanger steak is also very traditional in Mexican cuisine, particularly in the north where it is known as arrachera, and is generally marinated, grilled and served with a squeeze of lime juice, guacamole, salsa, and tortillas to roll tacos. In South Texas this cut of beef is known as fajitas arracheras. It is sometimes incorrectly referred to as flap steak or flap meat, which is a distinctly different cut. The hanger steak has historically been more popular in Europe. 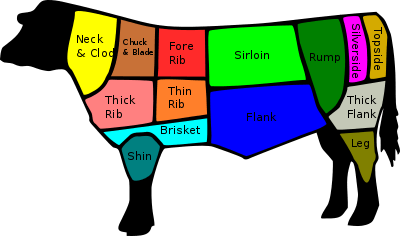 In Britain it is referred to as "skirt", which is not to be confused with the American skirt steak. In French it is known as the onglet, in Italian the lombatello, in Flanders the kroaie and in Spanish the solomillo de pulmón. Marinated raw hanger steak; note the grain of the muscle and the tough central membrane. ↑ Hix, Mark (2008-04-26). "Hanger steak with baked bone marrow". The Independent. London. Retrieved 2008-08-09. ↑ Duggan, Tara. "Butchers' best-kept secret". The San Francisco Chronicle. Retrieved 2016-08-02. 1 2 Green, Aliza (2005). Field Guide to Meat. Philadelphia, PA: Quirk Books. ISBN 1-931686-79-3. Dyce, K. M.; C. J. G. Sack; W. O. Wensing (2002). Textbook of Veterinary Anatomy (Third ed.). Philadelphia: Saunders. ISBN 0-7216-8966-3. OCLC 265038957.